Scottish politicians gave a round of applause to the founder of a Ukrainian neo-Nazi party today, prompting calls for a review of parliamentary vetting processes. 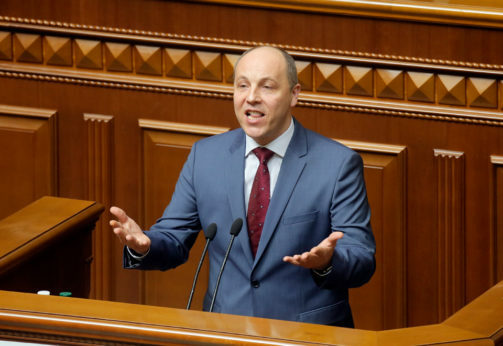 Andriy Parubiy, who co-founded the neo-Nazi Social-National Party of Ukraine (SNPU) in 1991, was welcomed in his role as chairman of the Verkhovna Rada, the Ukrainian parliament. The SNPU, which disbanded in 2014 and effectively became the Svoboda party, restricted membership to ethnic Ukrainians and had a Waffen SS-style Wolfsangel logo. Parubiy had left the party by 2004, when he was active in the country’s “Orange Revolution.” He has since stood for office on a number of right-wing nationalist platforms. He is currently affiliated to the nationalist and pro-European People’s Front. Just before First Minister’s Questions, Scottish Parliament Presiding Officer Ken Macintosh asked MSPs to join him in welcoming Parubiy to Holyrood [Scottish Parliament]. The Ukrainian took a bow as MSPs across the chamber applauded him. The spokesman said Parubiy was “presumably invited by the parliament” and directed the query to Macintosh’s office. At the close of parliamentary business yesterday, Labour Party frontbencher Neil Findlay led criticism of the debacle, saying that it was not right that MSPs were expected to applaud guests of whom they had no prior knowledge. “Members do not know who they are being asked to welcome,” he told the chamber. Macintosh said it was “my role as Presiding Officer to welcome” such dignitaries and it was “expected” that visiting parliamentary speakers would be welcomed. Parubiy is the former secretary of the National Security and Defense Council of Ukraine—a position he took up after the Euromaidan movement and violent removal of Viktor Yanukovych in 2014. He became the parliamentary speaker in 2016. Green MSP Ross Greer told the Star: “I’m quite sure Mr. Parubiy wouldn’t have received the polite applause from MSPs that he did if his past were known to those present at the time. The Ukrainian speaker was also received at the House of Commons in London this week, where he reportedly met Westminster Speaker John Bercow. At Prime Minister’s Questions on Wednesday, former cabinet minister John Whittingdale asked Prime Minister Theresa May to welcome him to Parliament. In 2010, Parubiy defended the wartime Ukrainian ultra-nationalist Stepan Bandera, who collaborated with the Nazis before he fell out with Gestapo command and was imprisoned at Sachsenhausen. Bandera was awarded the National Hero of Ukraine title by then Ukrainian president Viktor Yushchenko, which was condemned by Jewish and Polish groups and in a motion passed by the European Parliament. “I’m confident that the European Parliament’s decision should be reviewed,” he said at the time. 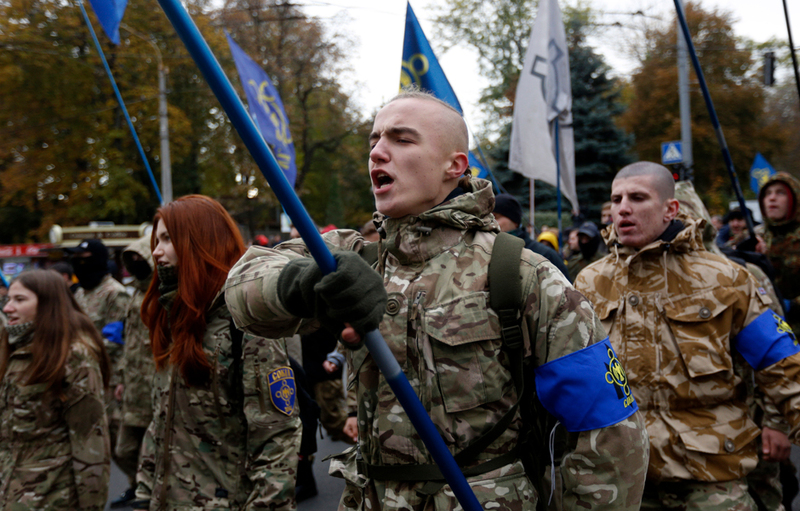 After Parubiy’s departure, the renamed Svoboda publicly attempted to move into the mainstream. But its deputy leader, Ihor Miroshnychenko, wrote on his Facebook wall in 2012 that actress Mila Kunis was “not Ukrainian but a zhydivka”—an anti-Semitic slur. Two years later, it would face widespread allegations of fascist thuggery during the overthrow of Ukraine’s government. 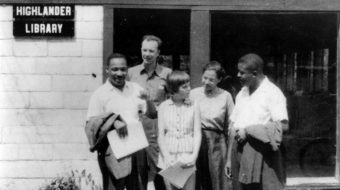 Conrad Landin is the Scotland editor of Morning Star, where this article originally appeared. 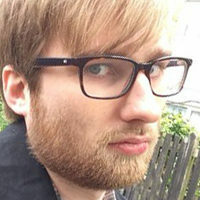 Conrad Landin is a Glasgow-based journalist specializing in labor politics, industry, education and transport and Scotland editor at Morning Star, the socialist daily. He’s also written for the Guardian, VICE, the i, the Camden New Journal, and New Statesman. He blogs for London Review of Books and appears from time to time as a broadcast pundit on Sky News, LBC, and BBC.